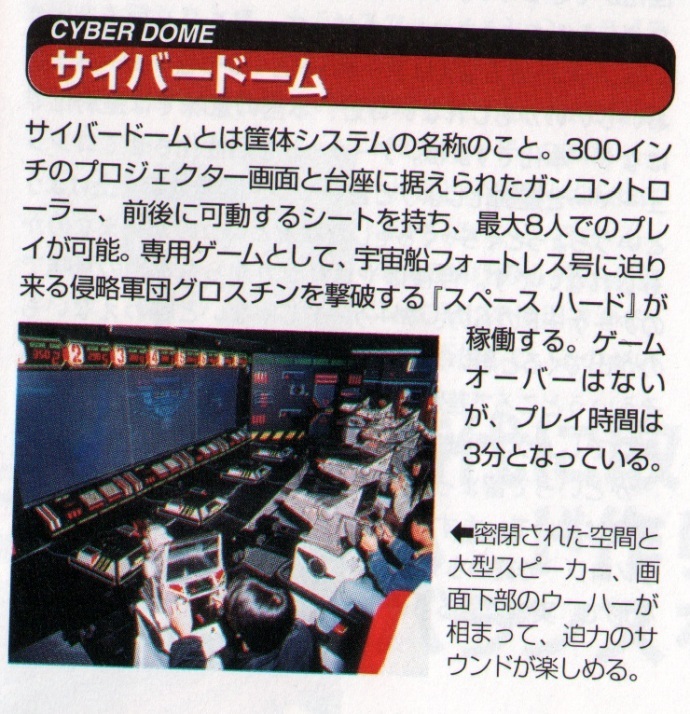 SEGA CYBER DOME - a 'Galaxian Theater' like? Dragon's Lair Fans - Arcade Lifestyle > General Chat > Galaxian Theater > SEGA CYBER DOME - a 'Galaxian Theater' like? It would be very interesting to know more about the thing. It looks very similar than Galaxian3... I presume it works with laser disc too? Maybe someone here already try this? Probably in Japan only? 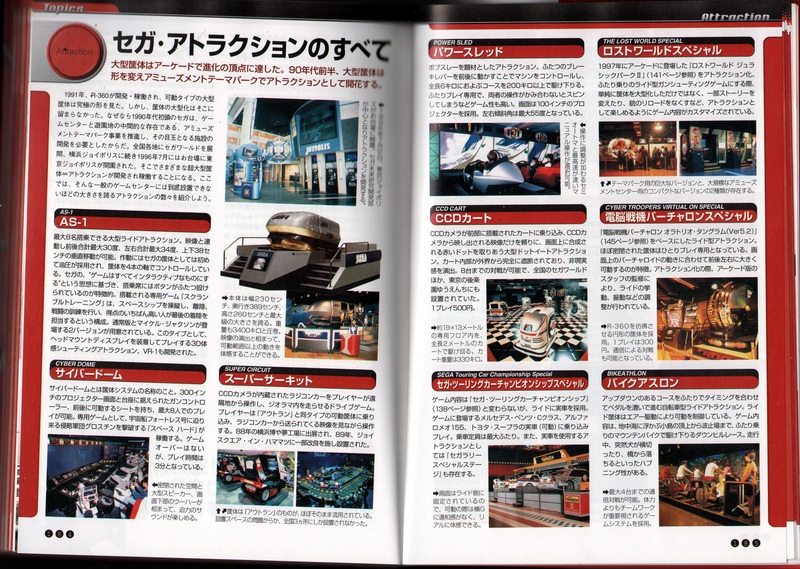 Re: SEGA CYBER DOME - a 'Galaxian Theater' like? I knew that the 360 thing would have had some echo in some way..
you have the Famitsu Book's Sega arcade history book, do you? If bruno calls, maverick responds. Cyber dome is a specialized moving cabinet with gun controller game visualizing an image on a 300 inches projector tv. It can be played up to 8 players simultaneously. In the desciption there is mention about laserdisk control or laserdisk functions..
Cyber drome is specialized moving cabinet with gun controller game visualized on a 300 inch projector tv. Ps= I talked this afternoon with ANY for the 360 hack, we should find an after burner board (X board) to see to start the study of the adapter..
That's a great news ! Amazing to see the enthusiasm around the R360 too ...Related to this topic. It contains music from Rad Mobile, Laser Ghost, R360 (Yes, that's the title of the game), GP Rider, Shining and the Darkness, and especially Cyber Dome. 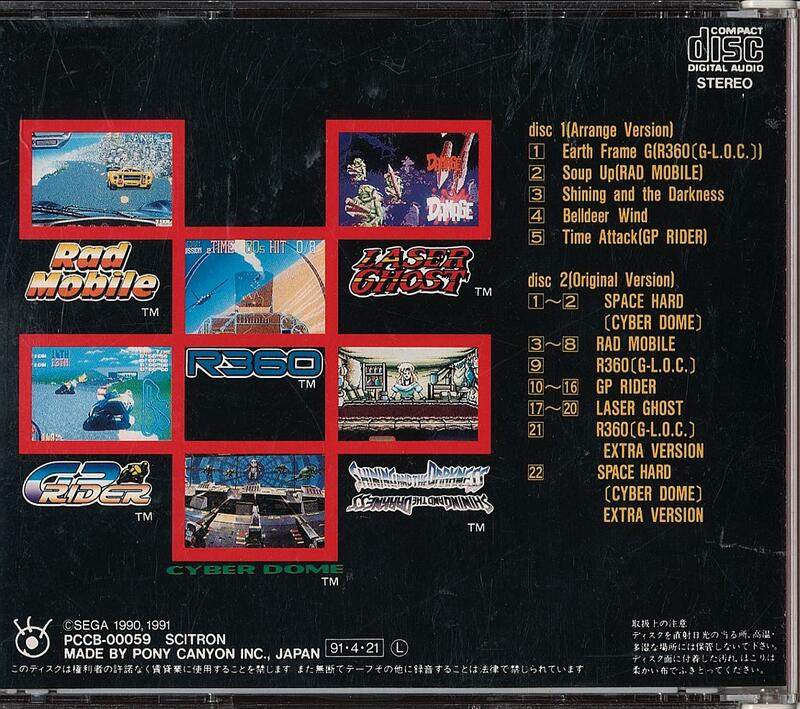 The music order on the CD kinda seems similar to the one in NAMCO's Final Lap G.S.M. Well spotted! First time I can see some real (but too brief) video footage of the Cyber Dome! It looks like they used sprite scaling for it instead of the polygon + LD combo Galaxian 3 uses. Oh curious minds! I would like to know what the Virtual on special is (and how it relates to the Sega R360), as I have never heard of that one. I would also like to know what Sega CCD is, as I have heard of this one, but have zero information on it. Holy crap there is a moving solvalou in that video!